Melodically, heavy metal was invented by the Christian church. Honest. At least, the perfect fifths of chanting monks underpin the genre. No, they do. A powerchord is typically a root-note and fifth. Slide it all over a guitar fretboard and you’re riffing. OK, so it’s more complicated than that, but it is reasonable to argue that rhythmically, HM, like much modern music, is rooted in the sounds of nature and aided by technology. Hitting a hollow log with a stick, mimicking a rapid heartbeat and encouraging people to groove, is technology and nature in cahoots. Kill a mammoth, stretch its skin over the end of a hollow log and you’ve a drum. While it may have taken until the Bronze Age to devise cymbals, rhythm instruments changed little until the early 1930s when Léon Theremin devised perhaps the world’s first rhythm machine, the photo-electro-mechanical Rythmicon. Let’s skip a few decades to land, with a satisfying thud, in the late 1960s and the origins of HM lyricism. Metal was a reaction against the loved-up, happy-lah-lah of hippiedom; something to remind us that life has a darker side and whatever it was you saw while on LSD might not have been The Truth. Heavy-metal drummers pounded their way through the ‘70s, ‘80s and ‘90s gradually taking up more and more space on stage with twin-kickdrum kits sporting an ever more ludicrous number of toms and cymbals, all while happily oblivious to the technological strides being taken in dance music. A company called Ace Tone, later Roland, had set the ball rolling in ‘67 with the mass-market launch of the Rhythm Ace FR-1. This rhythm machine was a synthesis-based, preset-only affair, hence comparatively limited, but it proved a hit among contemporary musicians and so development continued. It took until 1980 for digital sound sources to appear. The digital Linn LM-1 prompted many drummers to get a handle on rhythm programming for fear of unemployment, but more significant that year was the launch of another Roland product, the TR-808. This synthesis-based drum machine, along with its successor the TR-909 and, everyone’s favourite squelch-box, the TB-303 Bass Line, propelled multiple genres of dance music into the 21st Century. However, something a little more trick was necessary to turn the heads of metal-heads. The output of Roland’s synthetic gadgets can hardly be described as very metal and if it came down to a fight between them and a metal-drummer’s kit, my money would be on the 10-tom Tama. What metal demands are big-sounding kicks, snares and toms with enough of a diaphragm-wobbling thwack to induce emesis and sufficient midrange click to cut through the wall of sound generated by the guitarist/s and bass. Add splashy, sploshy cymbals plus some tricky-to-master, twin-kickdrum playing technique and you’ve the basis of a solid, driving HM percussion section. For that to be reproduced sans drummer, we need a sophisticated programming environment and sampled sound sources. Let’s see how Toontrack has managed to deliver the goods to your DAW by stuffing all that massive, meaty metal power into a laptop-friendly software trio. It’s clear that folk at Swedish developer Toontrack learnt American, not English, at school. 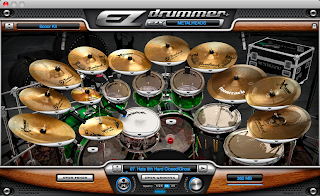 After all, ‘ee-zed’ drummer, as a Brit would have it, doesn’t make much sense and there’s nothing much ‘eased’ about metal beats, unless the drummer’s stoned. The product has been out since 2006, so it’s worthwhile trawling online forums and casting an eye over reviews that have gone before to see how it’s got along since launch and to assess the impact of a number of version updates. Well, I have done, but we’ll come to all that presently. 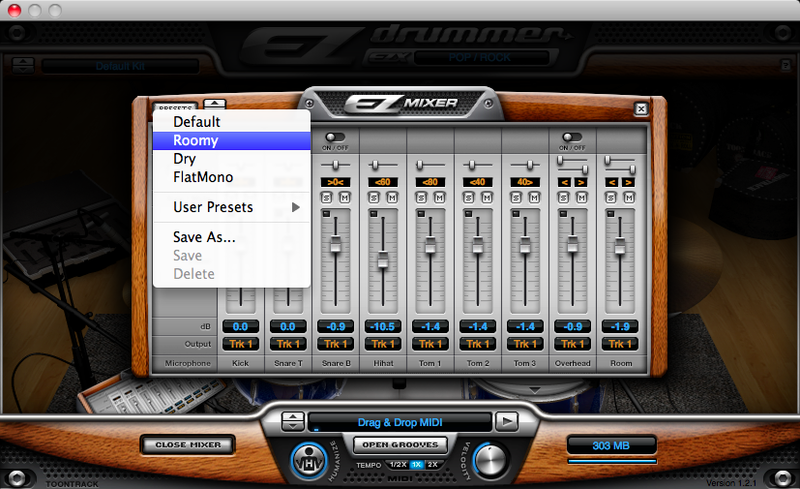 First, if you’ve yet to make Ee-Zee-drummer’s acquaintance, slurp this vid for an idea of Toontrack’s intent. That’s the developer’s take. We’ve a velocity-layered collection of more than 7,000 drum and cymbal samples that can be triggered from a MIDI keyboard, or other hardware controller, and from a DAW. Velocity layering, combined with the Humanize function, avoids a 1980s’ burp-gun sound on drum rolls and drags, as used to irritating effect by New Order on 1982 single Blue Monday. 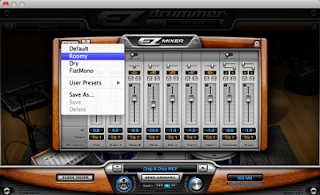 The levels and pan positions of drumkit pieces are adjustable via a mixer, as are the levels of mic bleed and room ambience, while individual items can be swapped using the drop-down menus in the main interface. Or you can hurry things up when straying from default settings by choosing Tight, Ambient or Basic configurations that are applied globally. Usefully, you can store any edits you do make to mixer settings, such as relative levels, pan positions and ambience from the overhead and room mics, all ready for later recall. 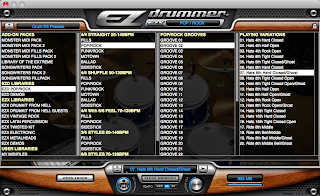 More than 8,000 MIDI files present a bucketload of grooves in 4/4, 3/4, 6/8 and more - just click on the Play icon to audition the files selected in the Grooves interface. 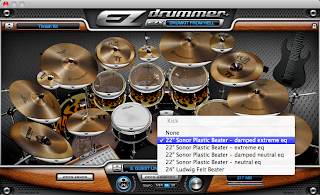 Further, there’s also the means to point EZdrummer at your own MIDI file collection, making for a near limitless library of performances. Listen to files loop at 1/2x, 1x or 2x tempo, then drag-and-drop your selection into a sequencer track, or spread it across eight tracks, ready for further editing. And here’s where our first whinge crops up. 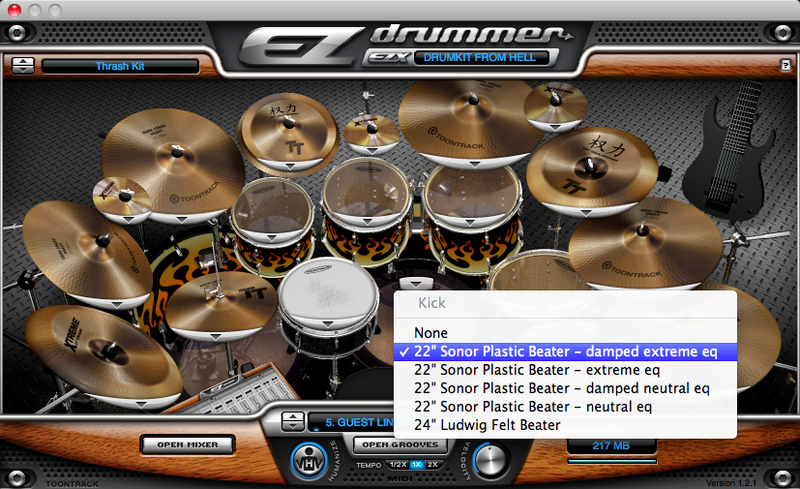 EZdrummer is a VST/AU plugin (PPC/Intel Mac OS X 10.4.11+ and PC Windows XP SP3+) and cannot be used standalone. Well, quit yer whining and head for freebie download Toontrack solo which, as the name implies, provides a standalone environment that’ll host the many EZX expansion packs available. Which brings us to our second gripe du jour: The bundled Pop/Rock kit sounds rubbish. I disagree. Toontrack has already part-processed the percussion with compression and EQ so that the product sounds OK straight out of the box. But it’s up to you to get busy with the DAW’s built-in sound-sculpting facilities and/or 3rd-party processing plugs, beefing things up to heavy metal proportions. This, however, is missing the point. 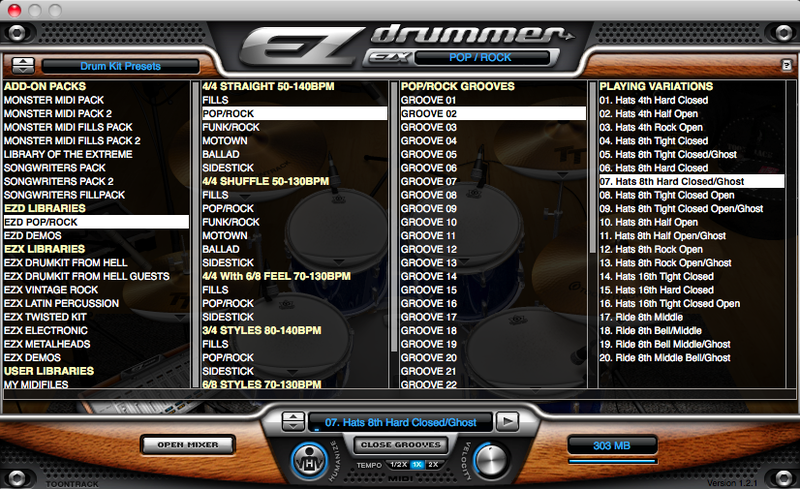 By itself, EZdrummer/Pop/Rock is more of a songwriter’s sketchpad than a full-on production tool. 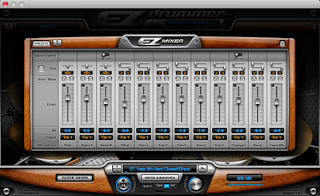 It enables you to extemporize percussion arrangements rapidly and EZ-ly, perhaps while away from the studio and toting just a laptop. And even when in the studio, it’s a handy thing to have on hand when sketching ideas in the DAW. Toontrack Percussion Compression means that it doesn’t hog system resources while sitting about waiting for your muse to wake up and, because the sounds are loaded into RAM, it’ll respond without glitch when creative juices start to dribble. 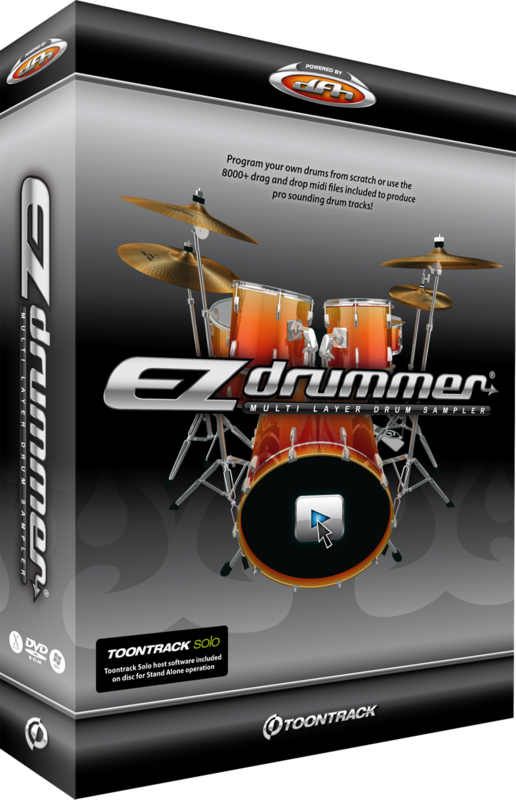 My only major moan is that, while EZdrummer works just fine as a 64-bit plug on Windows 7 (Cubase 5.5.1), Toontrack is yet to develop it for 64-bit on OS X Snow Leopard for Mac. Launched in Apple Logic 9.1.2, there it sits in the 32-bit Instruments menu relying on Logic’s 32-bit Bridge to enable communication with the host. Also, during the test period, the Bridge had a habit of crashing. Whether this is to do with a Windows to OS X porting problem, 64-bit unfriendliness or something more sinister, I know not as yet. If you've had similar difficulty, let me know and I’ll investigate further - tell me in the Comments field. Rather more pokey, no? 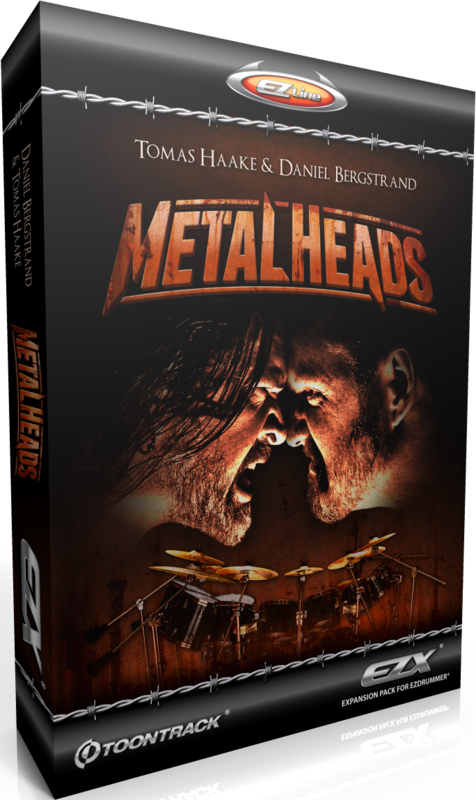 Metal connoisseurs might like to note that the samples for DFH were captured and produced by Meshugga’s Tomas Haake and Fredrik Thordendal, along with Daniel Bergstrand and Mattias Eklund. Thordendal and Haake also contributed MIDI files to the collection, as did Owe Lingvall (Nocturnal Rites), Mattias Grahn (Naglfar) and Efraim Juntunen - a stellar selection of Scandinavian smithies, then. To save me blithering on about the finer points of DFH’s tone and implementation, I’ll leave it for your ears to decide. No EQ or compression has been applied to the following clips. Actually, I didn't even normalize them, so you may have to turn your sound system up a bit... DFH medium - from Hell! A mid-paced taste of DFH's default kit with much sploshy cymbal to boot DFH heavy - from Hades! DFH goes all speed-metal - hear the dual kickdrums rattling away at the bottom end DFH fast - as the Wings of Death! Tribal tom patterns evoke a brutish metal mood DFH Haake's horror-fest! Cool fills and grooves played by Meshuggah's Tomas Haake (video interview below) DFH Lingvall - Lord of All Darkness! Rather more metal, nej? As you’d expect, more items in the kit means that a bigger mixing desk is needed. And lo! We’ve 12 channels available in DFH, including dedicated channels for room and overhead mics. What really does stand out, however, is the snare collection. It’s almost worth acquiring DFH solely for access to multi-layered samples of this lot: Atotte 4x14-inch maple shell, Ludwig 8x14-inch, Pearl Sensitone 6.5x14-inch bronze shell, Tomas Haake engineering 7x14-inch pockenholz shell and a trio of Sonor maple-shell models. Incidentally, if you’re wondering, pockenholz, or lignum vitae, is the same wood used to make the old-style British police truncheon and is just as stunning sound-wise. Cymbals are Sabian throughout, toms are Sonor and you’ve a choice between Sonor Designer Series 18x22-inch damped and undamped kick drums with neutral or extreme EQ, or Ludwig wood-fibreglass 24-inch diameter kicks. Having been on the market for so long, DFH has already received plenty of review coverage online and, in the main, has been showered with plaudits. It still deserves them, despite a good many alternative sample-based rhythm products having come to market since DFH’s launch. 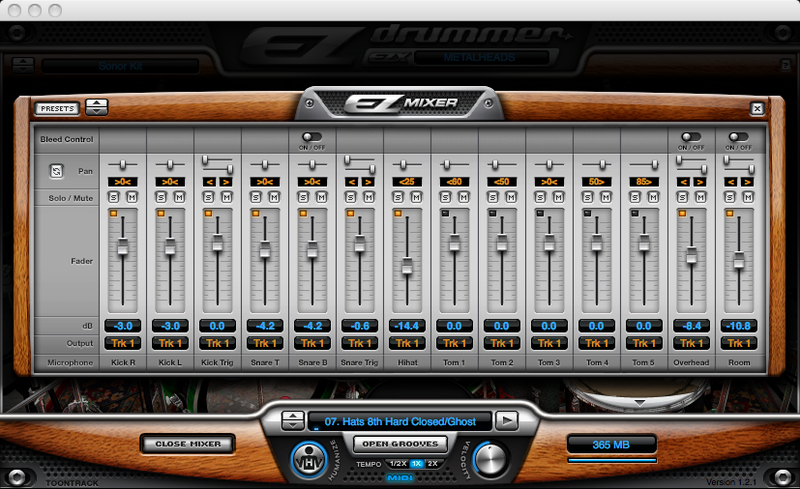 It’s heartening to see that the original kit along with a subsequent expansion, plus extra MIDI bits, have found their way into the EZX incarnation. 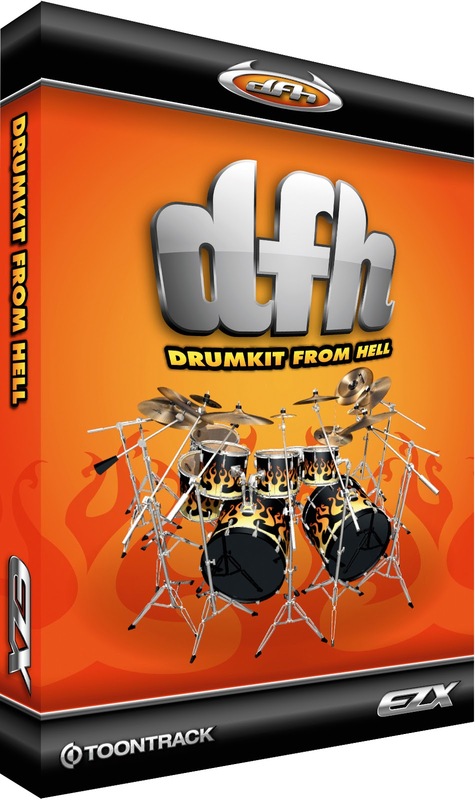 DFH goes a long way towards quelling qualms concerning the Pop/Rock kit’s efficacy as a production tool. Arrangements in need of more rhythmic thrutch will benefit from a heavier, livelier sound, although the plug responds well to being reined in when something more laid-back is called for. Twin kickdrums, five toms, splashy hats and 11 cymbals, supplemented by the aforementioned variety of snares, add up to a versatile percussion-sample selection. In combination with the Pop/Rock kit’s library, you’ve thousands of MIDI files to dig through when seeking an inspired pattern to drive the song along, including a huge number of fills for punctuation and rhythmic variation. 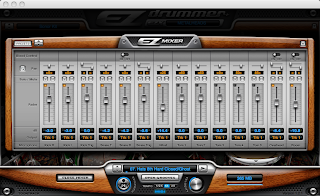 Such is DFH EZX’s usefulness, I’ve left my copy on the laptop’s System drive, along with a licensed installation on the studio workstation, so I can cart it with me when on the road. 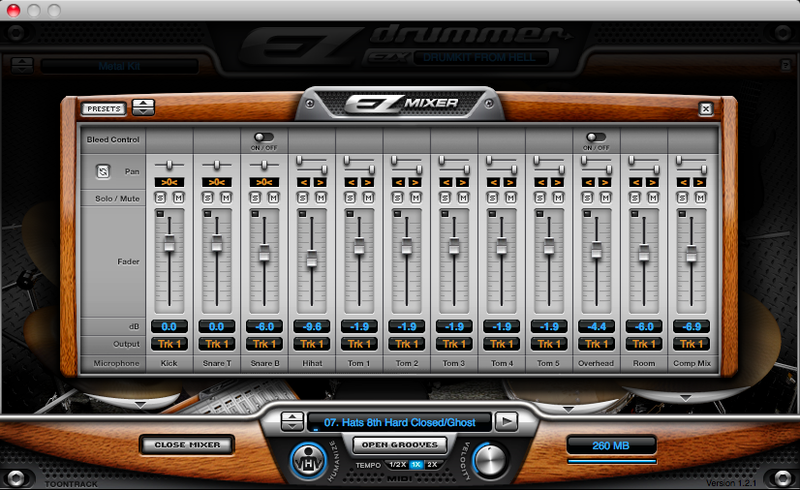 The punchy, characterful tone of this EZX proves that Hell ain’t no bad place for beats. *If you’re reading this in November 2010, note that UK distributor Time+Space is running a special offer until the end of the month. 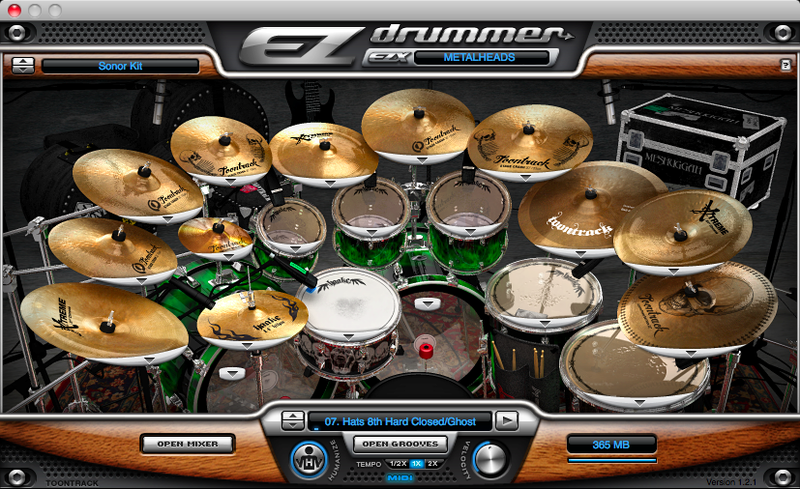 Buy EZdrummer and DFH together for only £89, as opposed to the usual price of £148 for both. Quite a saving.